Back in August, Jerry and I (well, okay, it was just I) had the crazy idea to knock down a wall in the kitchen. It wasn't a necessary wall, and it was very small. It was just there to hold up some cupboards. Once we did that, I loved it so much! 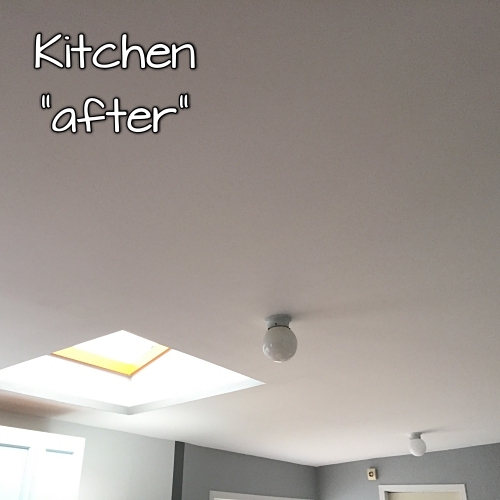 And that led to the idea that I wanted to get rid of our ugly textured ceilings. We live in a manufactured home (a.k.a. trailer, a.k.a. double wide, etc.) and textured ceilings are pretty standard. 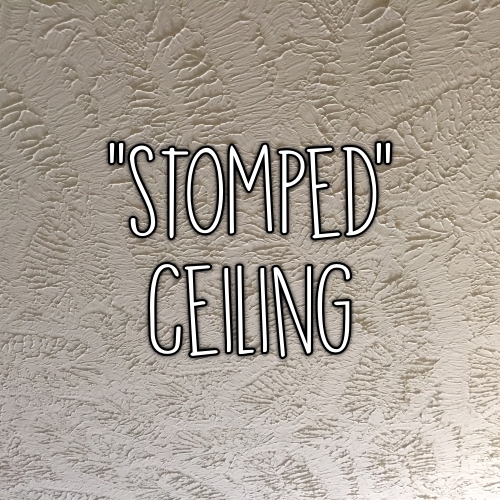 Our ceilings had a "stomped" texture, but the most common is a popcorn ceiling. So I'll refer to it as a popcorn ceiling here, because the process is the same. 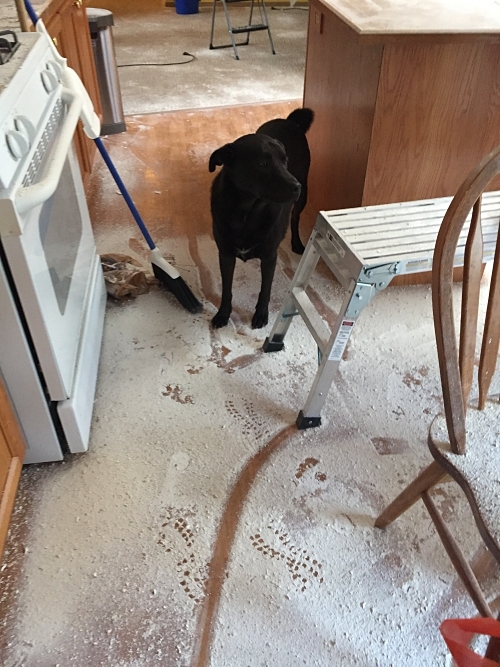 First, if you're thinking of removing a popcorn ceiling, make sure you are prepared for your house to be a complete MESS for a while. There will be drywall dust everywhere. The removal process is actually very cheap to do, which is a bonus. (If you don't already have the tools, someone you know surely will let you borrow them!) And overall, it's simple! 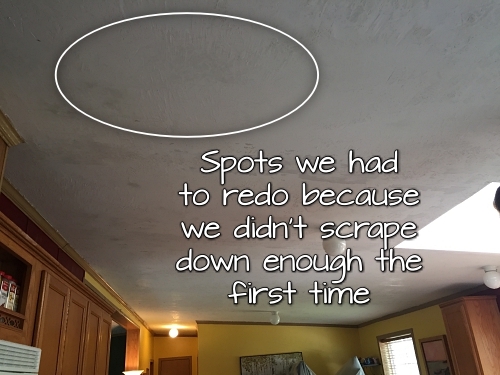 I was very surprised at just how simple the process of removing the popcorn ceiling actually was. 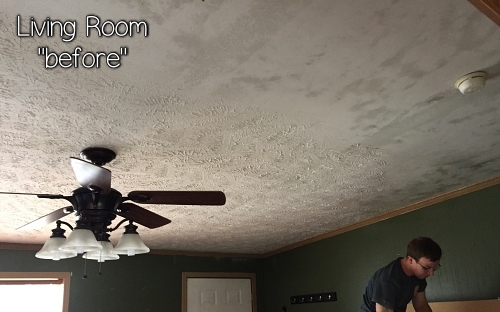 Here is how we removed the popcorn ceiling and then finished it to be a smooth, "normal" looking ceiling. *Cloth sheets won't work here. We bought some cheap bed sheets from Salvation Army to cover things with, but the drywall texture that falls down will be wet, and will make the cloths wet. *DEFINITELY pay a few extra bucks for the lambs wool roller cover. It is amazing, and I will never paint with anything else again. The paint goes on thick and covers really well. You can rinse it off after each use and use it again and again if you take care of it. This was the best investment we made while painting! 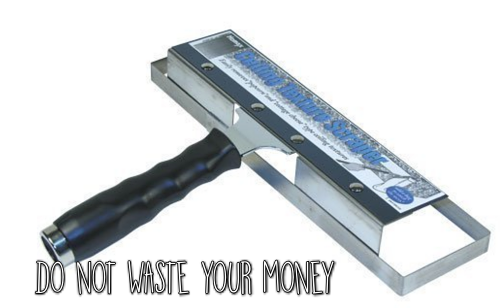 *Don't be fooled by this tool! I bought one, at it was worthless. 1) Choose a small section to work with at a time, and cover the floor and/or any furniture with the plastic sheeting. 3) Wait about 3-4 minutes to let the water soak in, and then using the 4-6 inch drywall knife, slide it along the ceiling at a slight angle. If the water has had enough time to soak in, the texture should fall off easily. You want to press firmly enough to go down as close as you can to the drywall (which is covered with brown paper), but not so hard that you are tearing up the drywall paper. You will likely make a few nicks in the paper here and there, which you can fill in later with spackling. 4) Continue to scrape the whole section that you've sprayed with water until you can see most of the smooth drywall underneath. It's not going to look "pretty" yet, but the texture should be gone and the ceiling should be mostly smooth. 5) Move the ladder and work on another section. Refill the water bottle as needed. Whenever you need to move the plastic sheet, you may want to dump the wet drywall in a garbage bag. It gets very heavy! 6) Once you have scrape the entire room, the ceiling will look kind of patchy and have little nicks in the drywall paper. When the ceiling is dry (it doesn't take long), use the spackling to fill in the nicks. Put a very small amount of spackling over the nick, and then hold the spackling knife at almost a 90 degree angle to the ceiling to scrape it flat. The spackling will stay in the nick, but will be flush with the ceiling. This will save a LOT of sanding later. 1) Follow instructions on the drywall compound container; but if you use the one that I recommended above, it's pretty simple. I added a generous amount to the mud pan and then added a little water to thin it out some. It shouldn't be super thick and hard to spread. I would say it was about the texture of brownie batter(?). 2) Starting at one end of the seam, apply a generous amount of drywall compound (this will be thinner than spackling). Using the 6-inch drywall knife, spread the compound from the edge of the wall toward the center of the room about 12 inches or so (it will look a little sloppy, because there will clearly be excess compound on it). Then, take the 8-inch knife, and go over the same spot. This will make the compound spread out a little farther in each direction. Then use the 10-12 inch knife to go over it one more time. What you are doing is filling in the small indentation that the drywall seams create, and you are making that flush with the rest of the ceiling so that the ceiling is flat. When you hold the 10-12 inch knife perpendicular to the seam, you shouldn't be able to see any light passing between the ceiling and the knife. 3) Continue to do this every couple of feet until you reach the end of the seam. By this point, the whole seam should be covered with a very smooth layer of compound that is flush with the ceiling. You'll likely need to sand it, but the better job that you do with the compound layer, the less sanding you'll need to do. 4) Finish all of the seams on the ceiling. 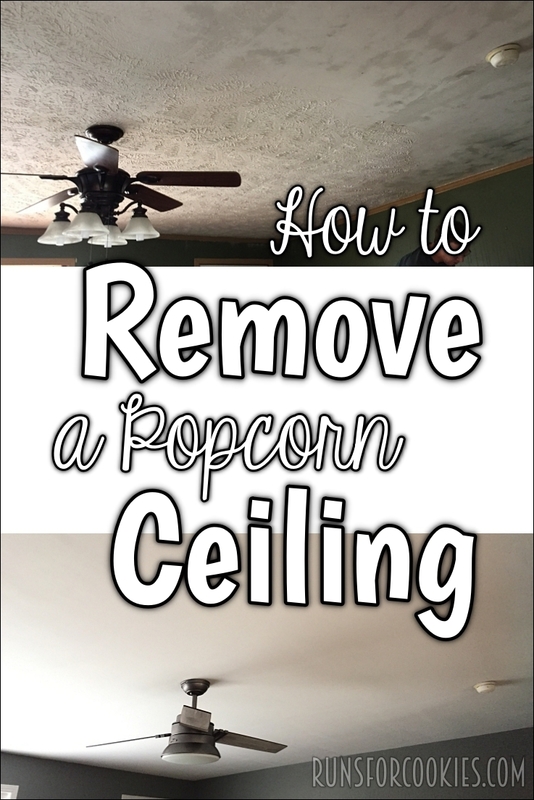 At this point, your ceiling will look patchy--the seams will look whitish-gray from the compound, while the rest of the ceiling will look white-ish from where you scraped off the popcorn ceiling. It will basically look striped. 5) Now comes the really, really messy part. 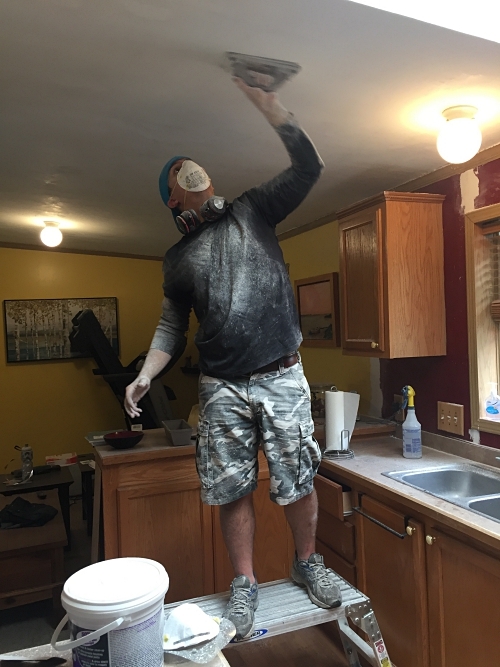 You will need safety glasses and a dust mask or respirator to keep from inhaling the drywall dust when sanding. 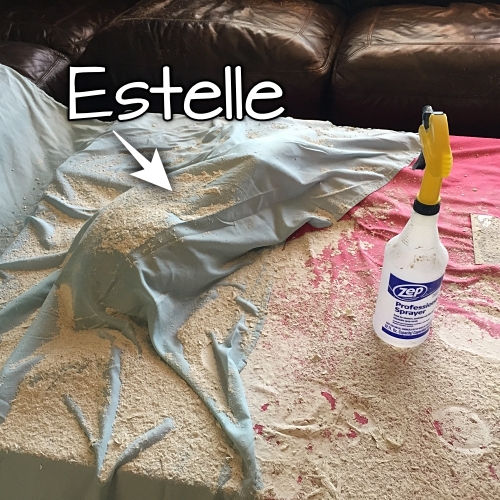 You can use an electric sander, but we found that to be inefficient and WAY too messy. 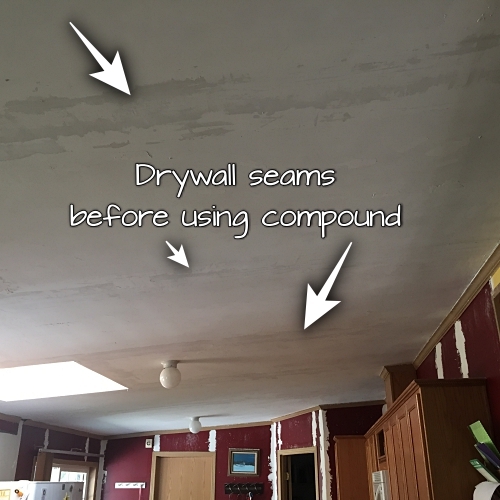 The drywall compound is too thin in most areas to sand without much control. We used drywall sanding screens on blocks with handles. And a fuckload of elbow grease! 6) Again, working in sections, sand the ceiling smooth. There will be a TON of dust. It will get everywhere, no matter how good of a job you think you are doing with controlling it. 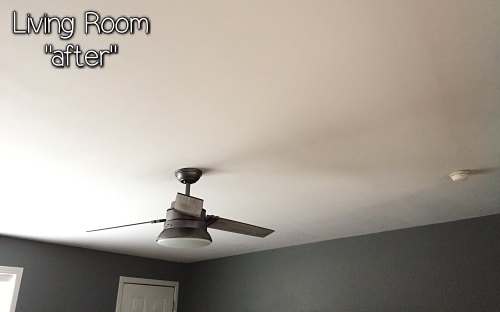 You'll want to gently sand over the entire ceiling until it's smooth. Keep in mind that paint will NOT cover up your mistakes. You really do need to take your time to do the sanding. 7) Once the sanding is done, clean up all the dust. (HAHAHA! We are still cleaning dust that we find in the most random places). With a lightly damp cloth, go over the ceiling one more time to make sure that there is no dust on it and that there aren't any more nicks to patch or bumps to sand. 9) Let it dry, and then give it another coat of primer. 10) Let it dry, and then go over the whole thing with the ceiling paint. Twice. Once it's dry, admire just how different your ceiling looks! We were THRILLED at the results. 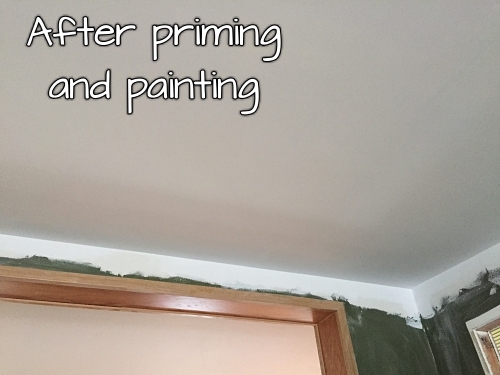 We also had to remove crown molding from each room and then tape and mud the seams between the walls and the ceiling, which was a very tough job--I'll save that for another post. But the difference is amazing! It's going to be SO SO SO messy. No matter what precautions you take. It will be tedious. But it will be WORTH IT. There is a learning curve when applying drywall compound. But the more you practice, the better you'll get at it. Sanding is tough work! My brother kept telling me to make sure that I took my time with the drywall compound so that I would have less to sand later. I didn't really heed his advice, and I regretted it when I started sanding. 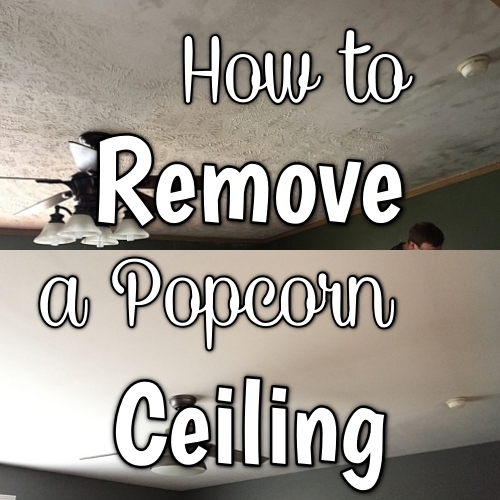 Make sure that you scrape the popcorn ceiling down to the drywall. On our first pass, we didn't go down far enough (see video above), and we later noticed there was still a little texture in random places. That turned out so good!